We forgot the punchline to this one, but it involves rolling around on an almost certainly sticky floor. 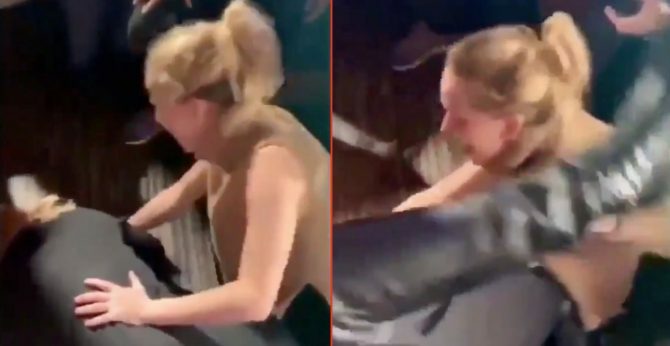 That was the unexpected scene at Pieces in New York City’s Greenwich Village on Friday, as the famed performers popped in to have some drinks and a good time. You know, just like regular people. The crowd, naturally, was excited to see the pair cutting loose. At one point they even hopped up on stage and participated in a drinking contest. For those keeping score, Lawrence easily won. And Adele didn’t take to losing well–we can see how that might happen when you’ve accrued fifteen Grammy awards. But Lawrence has three Oscars. You do that math. “You’re f***ing engaged. You’re not even relevant to be here!” Adele screamed. I was there too-they weren’t obnoxious like they were in NY! Bittches be ruining our bars-stay away!!! …ahh! they’re just having fun, nothing intentional here. If women go into gay bars and make people laugh then bring it on! Though sometimes gay bars have a rule and say no ‘straights’ allowed, because they can stir up anti-gay feelings which is strictly forbidden..